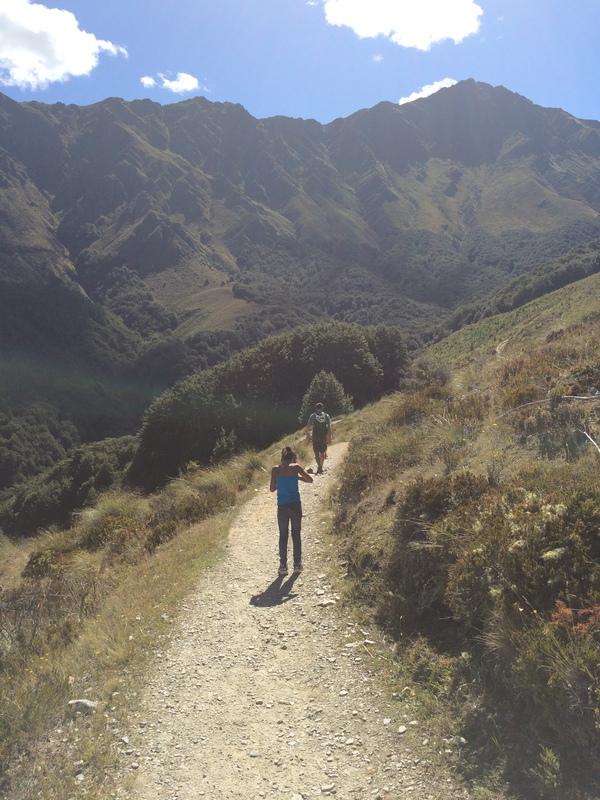 Ahhhhh New Zealand, what’s not to love about New Zealand? Long, long ago a very wise woman strongly encouraged me to go to New Zealand (Brendan Sullivan’s mother to be exact and she pretty much laid on the tracks and wouldn’t book my Australia trip without a New Zealand leg—thank goodness because she knew what she was talking about!). We arrived very late at night—after midnight on wonderful Qantas (best airline ever!) and were picked up by the Jucy Rental shuttle driver and delivered to the rental car parking lot. I walked into the office and gave them my driver’s license and a credit card and they handed me the keys to a fairly well used four door car. We really should have named this car—remember how you used to name your car in high school or college because it had a lot of character—this was exactly the same situation. If we had named her I think we could have called her Mabel—steady, sure, and not so speedy. We loaded ourselves and our bags into Mabel and headed off into the darkness. Problem #1—we have no idea where we are going and it’s really really really dark. Problem #2—it’s after midnight and we are really really really tired. 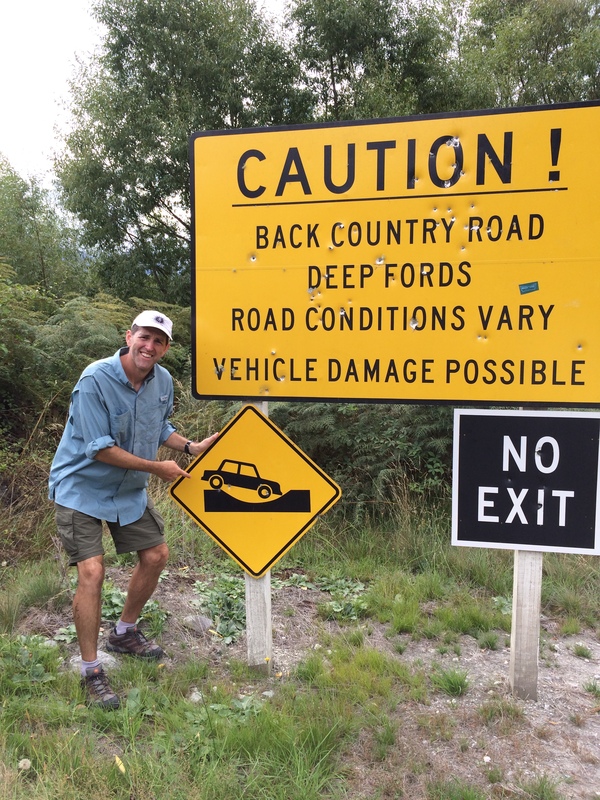 Problem #3—is it really a best practice to send an American off onto New Zealand roads which drive on the left instead of the right without any sort of instruction or rules of the road? Yikes! 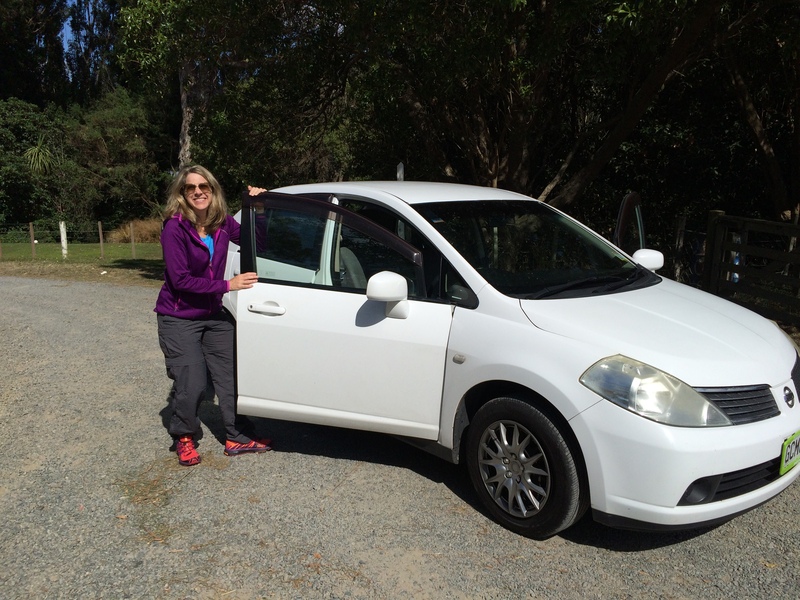 Luckily we navigated fairly well and found our way through the outskirts of Christchurch to our little rental house which I found through Airbnb. The house was cute and small….but was actually someone’s house that they lived in—which felt really weird. It was a single mom and her toddler son and since we had rented the entire house—they were staying in a campground down the road (only in New Zealand!). I felt bad that we were kicking them out of their house and it was strange to be sleeping in someone else’s bed that you didn’t actually know—so I was glad to only be there a few nights. Because of the earthquakes the downtown area needed a way to get business back up and running quickly, so they built a container town. Literally shipping containers that people built shops in and they connected with power and internet. We saw restaurants, banks and book stores in Container Town and ate lunch there. 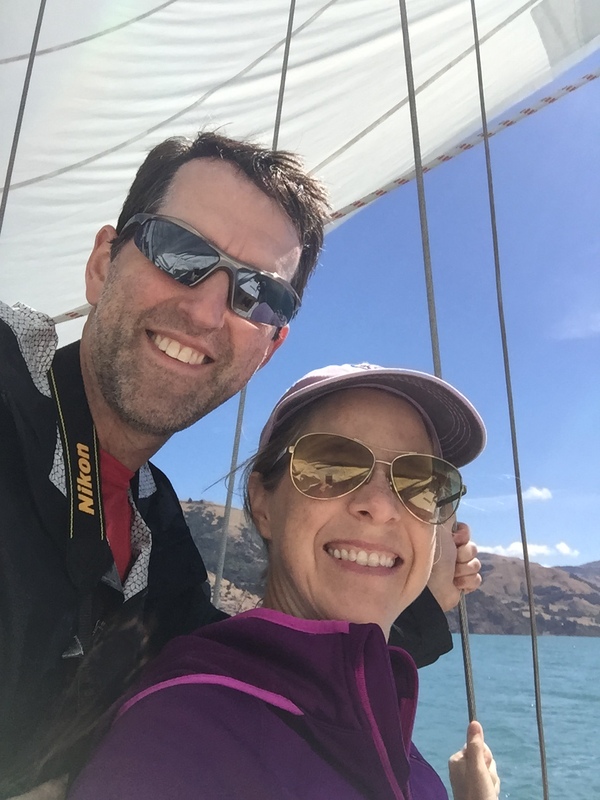 It was inspiring to see how people wanted to get back to work and make things happen for the city–it’s been a slow process..
We had a fantastic day in Akaroa where we went on a sailing cruise—quite by accident. We planned to take one of the dolphin watching cruises and I tried to book it online ahead of time but didn’t receive a response from the company. We went ahead and drove over to the west side of the Island and found out quickly that a large cruise ship was in town, which basically meant all of the dolphin watch cruises were full. 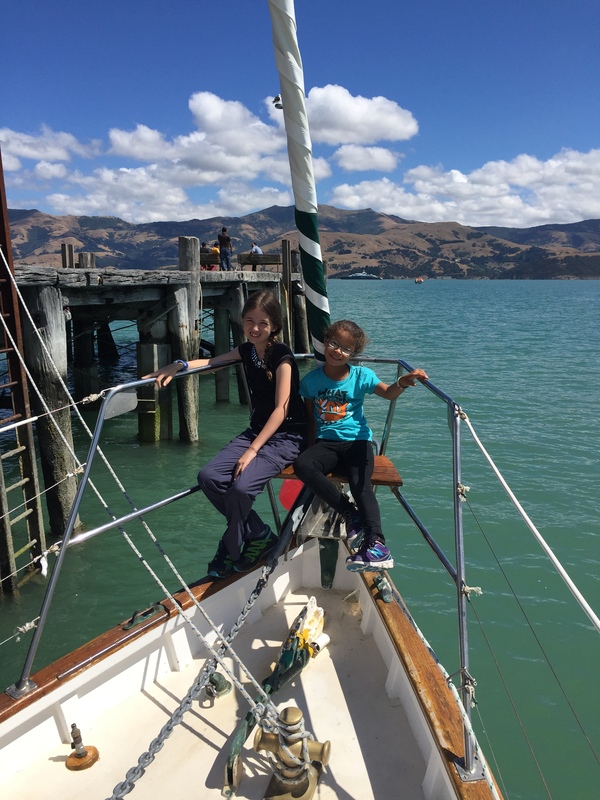 We walked to the end of the dock and found the Akaroa Sailing Cruise and Captain Ray. It was a first class experience on a beautiful boat with a fantastic captain. We watched Hector’s Dolphins swim around the bow of our boat—they frolicked and played in the wake and were having a fantastic time. At one point we probably had close to 15 dolphins swimming around the front of the boat. These dolphins are endangered and if you see one you’ll recognize it by its black Mickey Mouse ear for a dorsal fin and pale body. We were in a very large inlet off the Pacific East coast, mostly protected compared to the open ocean waters. Almost like a giant lake surrounded by mountains, obviously an ancient volcano crater that has filled with ocean water. Another memorable sighting while in Akaroa was a GINORMOUS yacht called the Serene. You have to Google it—the yacht is close to 400 feet long, and is owned by an exiled Russian vodka tycoon. The boat includes own helipad and has other smaller yachts that it carries along. We were told that Bill Gates once rented it for a week for a holiday of his own. You know you’ve got something big when Bill Gates comes to you to borrow your stuff. The next day we rose early and headed to Queenstown via the long way—Jared planned a scenic route for us to take to Queenstown and we got to explore quite a bit of the South Island along the way. We were only about an hour or so into the drive when Bella started complaining that her tummy hurt. This was not the first time she had gotten car sick, but usually she can put her head down and sleep it off. Poor baby couldn’t get past the sickness and one look at her and we knew that this was serious, she was going to lose her lunch. Jared grabbed the McDonalds bag (don’t judge), gave it to Bella to puke in and told me to pull off the next chance we get. In the middle of the anxious instructions, Bella was filling the McDonalds bag. We felt bad for the poor girl, but Jared and I worked to keep a straight face, because he had just leaned over to me and said, “Really wished I would not have given her that sausage roll for breakfast.” As soon as he finished the comment the smell hit us in the front seat like a brick. All the windows got rolled down and it even distracted Lilli from reading on the Kindle. We pulled off and got reorganized and found Bella some motion sickness medicine. We’re not keeping track, but I think this was the second time Bella puked on the trip so far. Poor baby! The highways on the South Island are pretty wide open—it wasn’t often that we ran into another car—just beautiful mountain views and wide open fields and A LOT of sheep. 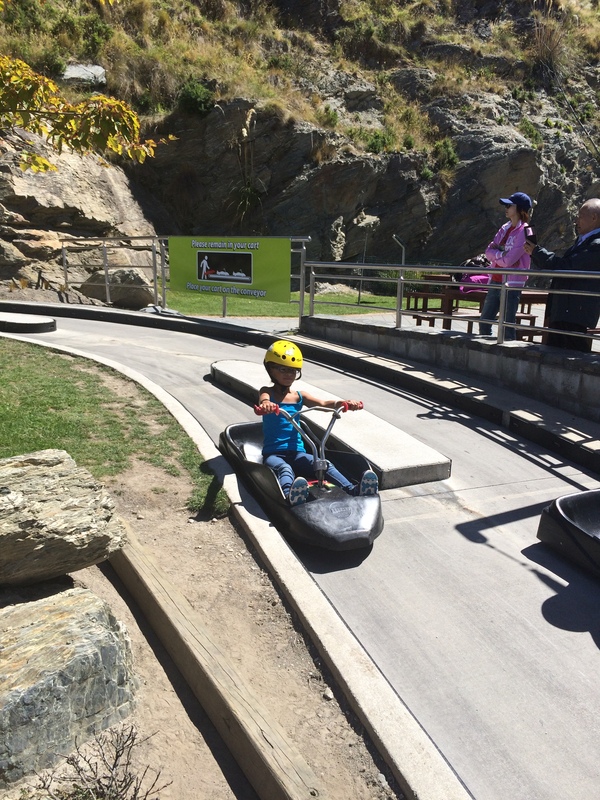 We arrived in Queenstown and stayed at The Redlands Country Lodge—which we really loved. It was a separate apartment on a working farm and we really enjoyed the lovely family that lived there and ran it. Carl, Vanessa, and their daughter Zoe were wonderful hosts. The girls really enjoyed playing with Zoe. They had horses, cows, goats, dogs, and cats—what more could two girls want?! We spent our days hiking, adventuring, zip lining, luge riding, visiting sheep ranches, watching working dogs, and horseback riding. We had a blast! 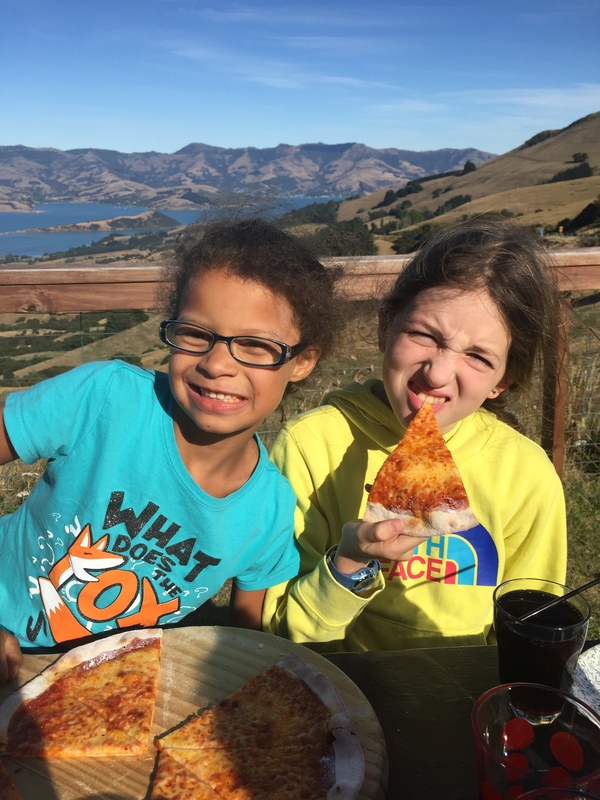 Our friend Margot started off our adventure with a fun scavenger hunt in the town of Queenstown—she had been there a month earlier and set up the hunt and clues for us. We carefully followed the clues to Mrs. Ferg’s where they have the best gelato on the planet—and even better– Margot had pre-purchased for us so it was free—thank you Margot! It was seriously good and we all have a bit of a Hokey Pokey (a flavor unique to New Zealand made with honeycomb and chocolate) ice cream addiction now. We rode the Skyline Gondola to the top of the Bob’s Peak and took the Luge ride down a couple of times, Lilli did the Swing (sort of bungee but you jump off platform and swing instead of bounce), zip lining, and hiking—all so much fun! Lilli was the bravest of the bunch and the only one of us who wanted to the swing. I posted it on FB and Instagram when she did it–brave girl! One day we took the TSS Earnslaw Vintage Cruise across Lake Wakatipu to Walter Peak Farm. The farm was a bust—it was supposed to be a sheep shearing, dog show and lunch. Lunch was slow and an enormous buffet where you were constantly shoved, pushed, and elbowed by all of the aggressive other guests (this is a theme in New Zealand unfortunately when you go to very touristy areas where the buses fill the roads and parking lots). The ‘oversold’ dog show consisted of two tired dogs that were tied to fences in the hot sun and then had to chase sheep up and down a big hill. Poor things! Then we all crammed into a small viewing area to see the sheep shearing. It was standing room only and really an awful thing to see—the shearer must have cut the sheep no less than 10 times during the process and the poor animal was a terrified bloody mess by the time it was done. The kids and I were horrified. I’ve seen sheep shows before and have never seen this happen—the guy was awful and shouldn’t be allowed to shear. The only thing that saved this debacle of a tour was the ride on the TSS Earnslaw. It’s a 1912 Steamer ship, that has been in continuous use since its maiden voyage 103 years ago, and the mid-section of the boat is open to view—the girls loved looking at the steam engine and watching the coal burning boilers hard at work. We hiked to an abandoned silver mine and were rewarded with amazing views of the Lake Wakatipu and the valley. Overall the girls like hiking, but they also like to complain all the way up, wanting to turn around. But they are total sandbaggers, giving us a good story about how their feet hurt or they’re tired or whatever. Then we see a great view or find some hidden treasure and they are all over it. Hopefully we’ll see less drama and more hiking like we saw at Waynu Picchu in the future. 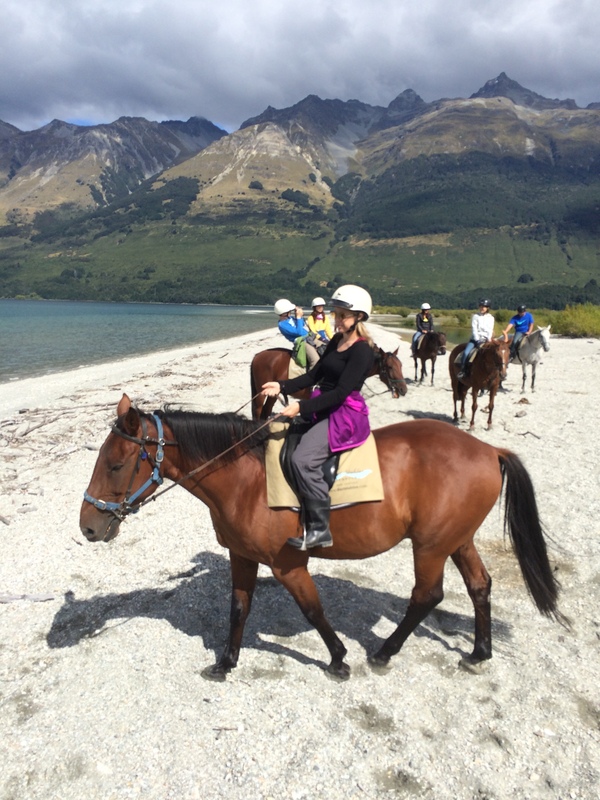 We also took a horseback riding trip through Middle Earth—The Lord of the Rings was filmed in New Zealand and some of the horses at the ranch we rode from were actually in the movie. The story was that the fancy horses that the film crew had brought with them didn’t like the cold water in the streams and rivers so they balked when it came time to do their scenes. The hardy New Zealand horses had no problem with the icy waters and gladly became movie stars in the spirit of “the show must go on!” Our final night in Queenstown we went to a Mexican restaurant with Carl, Vanessa, and Zoe and enjoyed the company and the food very much! It is so great so spend time with new friends who are locals and hearing what they love about their community as well as what keeps them up at night and they would like to see changed. Overall, Carl and Vanessa, along with most Kiwis, love living in New Zealand. The quality of life is great, the mountains, the low crime rate and the active communities are all factors that make people happy living there. The only real complaint we heard was about the bad driving of tourists (Exactly my first point about the rental car–we need driving lessons/instructions!). The other challenge is making a living in a small country with a finite supply of tourists. Even if you’re selling sheep wool or wine, it can be a tough place to make a decent living—but balance that with the great quality of life and it’s not really about the money–it’s about the experiences and memories you create with your loved ones. The people in New Zealand are really really nice–the consistently nicest people we have met so far on our trip–and that is a very high bar because we have met a lot of really great people. 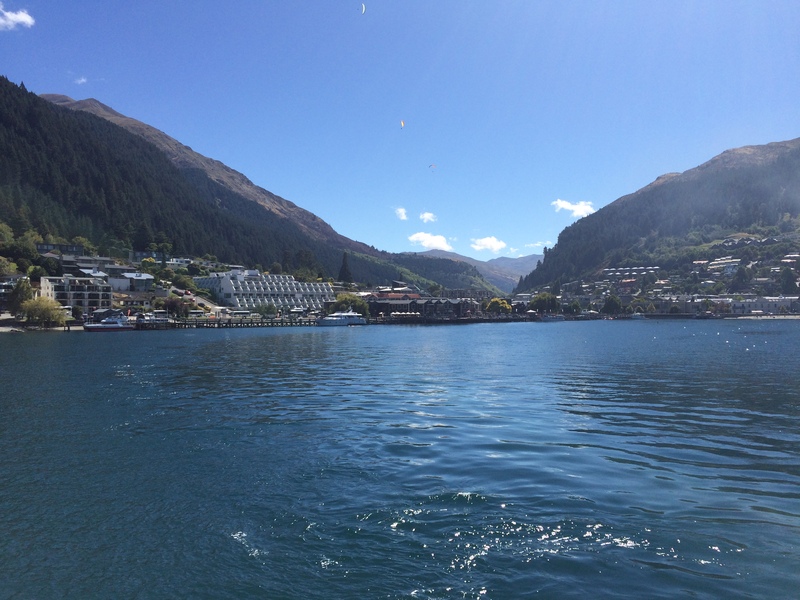 New Zealand is very clean country and really everyone’s yard, business, house, etc… is extremely well maintained. There is a lot of pride in the country and it shows. We left Redlands Farm on Feb. 26 made a quick trip to the highest point of New Zealand, Aoroki/Mt. Cook. More on that next time. Stay tuned. Hi, Jared, Kim and girls. Wow, I love reading about your trips. Thank you so much for taking the time to share it with us. The pictures are great. It sure sounds like everyone is experiencing the new wonders. We wish you continued fun and enlightenment! Wow!!! Congratulations Kim and family on taking this opportunity! What an experience to learn and grow from for the rest of your lives!